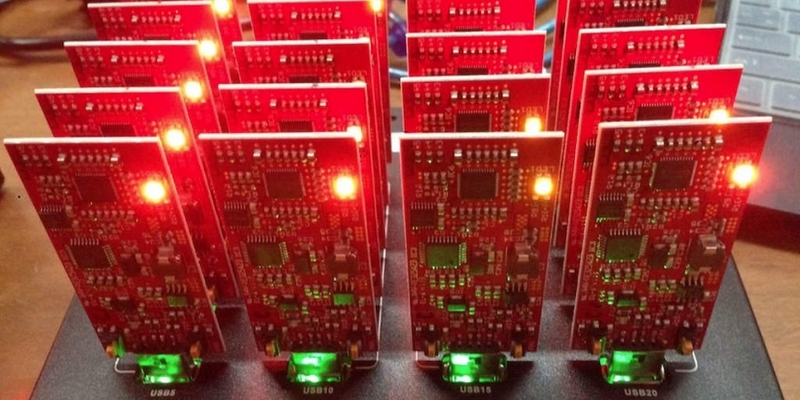 Another USB-based bitcoin mining device has hit the market. A company called RedFury, which announced its miner on the Bitcointalk forums, is taking orders for its 2.6GH miner, which is powered by plugging it into a USB port. The device is basically an ASIC board with a heatsink glued onto it for dissipation. The power consumption of the device is about 2.5 watts. The company is now selling the units for 0.49 BTC, which at a recent CoinDesk Bitcoin Price Index value is around $98 per unit. “We are aiming for new users who are wanting to get into bitcoin mining, and USB miners offer the cheapest capital investment now,” says RedFury’s Tiyo Triyanto. Triyanto, who says he is one of the largest bitcoin miners in Indonesia where electricity only costs three cents per kilowatt hour, told CoinDesk that RedFury’s aim is simply to contribute to the bitcoin community. “We are merely indie developers who share the same bitcoin passion,” he said. RedFury has posted a production video of the miner’s manufacturing process in an Indonesian facility. It’s a look inside what it takes to make a tiny ASIC miner. You can see the surface mounting process, USB soldering assembly and the heatsink assembly, which uses a 3M thermal pad to attach it to the board. RedFury isn’t the only company producing USB bitcoin miners. Asicminer has previously sold its Block Erupter line of USB miners, and CoinDesk’s David Gilson previously wrote about using them with Raspberry Pi as the host. The company’s website isn’t featuring that particular product, but a USB “Satoshi Stick” is apparently coming soon. There isn’t a website for RedFury, so you’ll need to contact the Bitcointalk forum member “oaxaca” if you’re interested in purchasing RedFury USB miners. USPS Priority Shipping to US addresses is included in the 0.49 BTC price. Shipping to anywhere outside the US is possible, but customers must pay shipping charges. While USB mining gear isn’t going to make anyone wealthy, Redfury’s Triyanto says that this product might be a good way to get someone started with bitcoin. “For expert users who are looking for bitcoin related gifts, they can use RedFury USB miner to introduce their friend/family member/colleague about bitcoin and/or bitcoin mining,” he said.